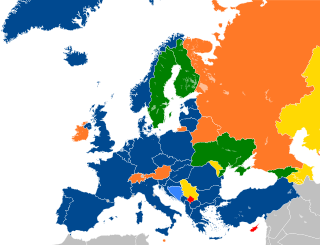 The Euro-Atlantic Partnership Council (EAPC), a post-Cold War NATO institution, is a multilateral forum created to improve relations between NATO and non-NATO countries in Europe and those parts of Asia on the European periphery. States meet to cooperate and go to the range of political and security issues. It was formed on May 29, 1997 in the ministers meeting of Sintra, Portugal, as the successor to the North Atlantic Cooperation Council (NACC), which was created in 1991. It works alongside the Partnership for Peace (PfP), created in 1994. On 20 December 1991, the first meeting of the North Atlantic Cooperation Council, hosted a meeting between NATO, Eastern European nations and the USSR. Near the end of the meeting, the Soviet Ambassador received a message that concurrently to the meeting, the Soviet Union was dissolving and would cease to exist the following day. The Soviet Ambassador noted that as of then, he was only representing the Russian Federation and no longer the Soviet Union. ^ "NATO Declassified - Dissolution of the Soviet Union announced at NATO meeting". Retrieved 28 March 2017. After achieving independence from the Soviet Union, the Republic of Moldova established relations with other European countries. A course for European Union integration and neutrality define the country's foreign policy guidelines. Transatlantic relations refer to the historic, cultural, political, economic and social relations between countries on both side of the Atlantic Ocean. Sometimes it specifically means those between the United States, Canada and the countries in Europe, although other meanings are possible. Dr. John J. Maresca is a distinguished Italian-American diplomat, business leader, and educator. Maresca has held a number of posts in the US government including Deputy Assistant Secretary of Defense and US Ambassador. He has also founded, led, and contributed to a number of prominent NGOs and private sector companies. He served as Rector of the United Nations mandated University for Peace (UPEACE) in Costa Rica until February, 2013.